One of many Maxwell landmarks in Scotland, Terregles House was a prominent fixture for 6oo years. Lying four miles west of Dumfries, the estate came into Maxwell hands in 1549 when Lady Agnes Herries, heiress of the 3rd Lord Herries, married Sir John Maxwell, son of the 4th Lord Maxwell. On the death of Lady Agnes's father in 1565, Sir John became the 4th Lord Herries, and Terregles would remain in Maxwell hands for 375 years until it was sold in 1924. The estate's precise beginnings are unknown, but King David II granted the lands to Sir John Herice in 1364. The Herice family, later known as Herries, descended from the de Heriz family that moved to the area early in the 12th century The families title was created in 1490 when Herbert Herries became the 1st Lord Herries of Terregles. The first part of Terregles House was a tower built by the Herries family in the 1480s. Sir John Maxwell added the central block of the house after marrying Lady Agnes and succeeding her father as the 4th Lord Herries. The castle's most historic event came in 1568 when Mary Queen of Scots, escaped to Terregles after being forced to abdicate as Scotland's monarch. She was pursued there by the Earl of Moray, who had been appointed Regent for her infant son, James, but Mary stayed a step ahead, escaping to Dundrennan Abbey with the help of Lord Herries. From there, she and Lord Herries crossed the Solway Firth into England, seeking the help of Mary's cousin, Queen Elizabeth I. Instead of help, though, Mary endured years in prison before ultimately being beheaded. The next in the family's line, the 5th Lord Herries, built the third tower of Terregles Castle about 1600. It was from Terregles that another famous Maxwell, the 5th Earl of Nithsdale, rode out to join the Jacobite uprising of 1715. And it was Terregles that the Earl's wife buried the family's papers after her husband was captured by the English, just before she left for London to engineer his legendary escape from the Tower of London and flight to safety in Rome. Between 1788 and 1800, the castle was demolished and replaced by the new 120 room mansion pictured at the left. The old building stood close to the site of the new one, but it was dismantled rather than incorporated into the later design. In 1831, a noted architect of that era added a monumental porch to the main entrance (on the left side in the picture above) and built a rear wing. 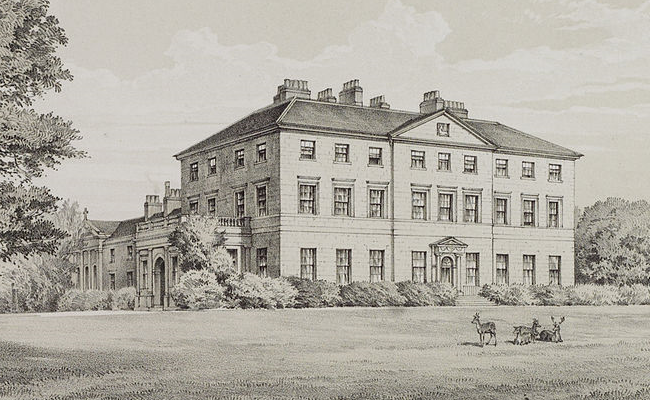 The architect, Sir Robert Smike, also was responsible for a new stable block that was built in the Classical style. The house itself remained in the Constable-Maxwell family for several more years before being sold with all its furnishings to James Clenaghan in the eariy r930s. lt was requisitioned by the government to house Norwegian soldiers during their country's occupation by Germany during World-War II, but Clenaghan returned the Terregles House to residential use after the war. He only lived in part of the house, though, boarding-up most of the structure and allowing it to fall deeper and deeper into disrepair. In the late 1950s, the Clenaghans moved into the gatehouse, and the main house remained empty until it was eventually gutted. Suffering from severe dry rot and fit only for destruction, the house was blown up in 1964.